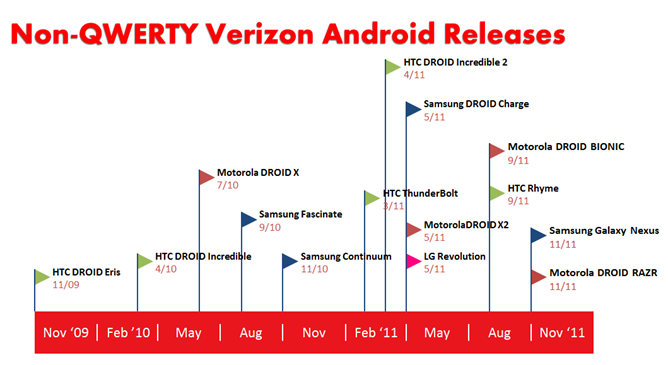 Timeline Graphic: US Android Phone Releases - We're Definitely Moving Faster, But How Fast Is Too Fast? There's been some discussion of late that, perhaps, Android phone manufacturers are iterating handsets at a pace which is detrimental to product polish and subsequent software support. In fact, a couple of days ago I took a look at the state of Android phones on US carriers with a few simple charts. I also promised to write another post looking at how quickly, as opposed to how prolifically, Android handsets are moving in the US marketplace. I decided to look at two carriers - T-Mobile and Verizon. In the interest of cleaning up the timelines, I decided not to include budget handsets or QWERTY phones, because we all know the subtext of this whole conversation: the iPhone. Apple's annual iPhone release strategy has been lauded over the allegedly haphazard and inconsistent product releases of Android manufacturers, and this has been used as evidence to suggest that manufacturers need to "slow down" in order to put out truly competitive products. Charts based on data from GSMArena. Does not include QWERTY phones, unlocked phones, or budget phones. The pattern is quite visible - Android phone manufacturers have definitely stepped up the rate of touch-handset iteration in the last year. On T-Mobile, Samsung and HTC are operating on a handset release cycle that is closer to every 6 months than every year. Motorola will have released three major touch handsets on Verizon over the course of six months once the RAZR is available next month. Samsung also appears to have a 6 month strategy on Verizon, and HTC's release of the Rhyme (though it's not a true flagship handset) seems to indicate it's stepping up its pace as well. Obviously, we can't really know if manufacturers intend to keep this pace up, as there's been significant incentive for them to iterate new 4G handsets since last year, when Sprint launched the US's first major 4G network - and it's been a 4G arms-race ever since. New network technology requires new hardware, so it's entirely possible device release cycles will slow in the coming year, particularly on Sprint and Verizon's networks. T-Mobile may have fewer handset releases in the coming year for other, unrelated (read: AT&T) reasons. But back to our question - are manufacturers moving too fast, at the expense of quality and software support? 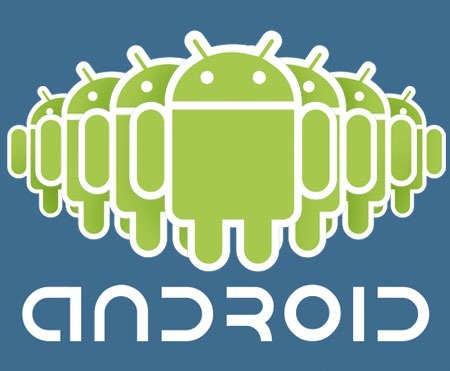 It's clear that consumers have a growing number of Android options out there, and manufacturers are doing their best to provide product differentiation among increasingly stiff competition. It's certainly conceivable that a DROID X2 or BIONIC owner would feel a bit slighted by Motorola's upcoming RAZR. It's not unreasonable to surmise that the RAZR will likely receive a quicker bump to Android 4.0 (if the X2 gets the bump at all) than either of those phones, simply because it's newer. And I know if I bought a Samsung DROID Charge only to see the Samsung Galaxy Nexus hitting shelves 6 months later, I'd be more than a little steamed. Still, there's also the very real fact that we're talking about an area in the tech world that is moving by leaps and bounds every 6 months, and manufacturers are trying desperately to keep up with the curve. Can we really blame them for making better phones as the technology becomes available? Or is the plight of users getting "left behind" in terms of software support something manufacturers should be paying more attention to instead of churning out hardware more quickly? It's a tough call, but in my opinion, living on the bleeding edge always carries that risk, and sometimes you're going to be on the losing end of it. Now if you'll excuse me, I'm going to go stare angrily at my BIONIC.